This week, many Americans will celebrate the 4th of July by enjoying fireworks. We love to see the explosion, followed by the colorful debris field as it expands and rains down from the sky. And, fireworks are often slightly different from one another — even if they originate from the same type of explosion. Of course, if they have different types or proportions of chemicals before in the explosive itself, the fireworks can look dramatically different. And, don't forget that the environment they explode into — include wind or clouds of smoke — can affect how they look. Well, you won't get to shake hands with the spacecraft, of course, because it's doing its job thousands of miles above the Earth's surface. You can, however, see a giant model of Chandra, view large-scale images, and meet many people who have worked on the mission during this year's Smithsonian Folklife Festival. During last week's AAS meeting in St. Louis, a "meeting within a meeting" was held to discuss plans for next year's International Year of Astronomy 2009 (IYA2009). One of the projects that Chandra plays a major role in is "From Earth to the Universe", also known lovingly as FETTU. This image was uploaded with the post From Earth to the Universe. With the press release for G1.9+0.3 we talked about when an event in a distant part of the Milky Way galaxy occurred. One delicate issue that immediately came to mind was what to do about the light travel time to this object. We decided to adopt the astronomer's convention and talk about events in Earth's time frame, that is when the light reached the Earth, as we noted in the press release and in a few other places on our web-site. In the last year we have seen tremendous development in visualizing the Universe through the digital world. Google Sky and Wikisky are examples of this progress. These interfaces have taken well-known all-sky surveys and detailed observations to create virtual observatories that show our nearest planetary neighbors, like Mars and Jupiter, to the most distant galaxies in the Universe. One of the most important tasks involved with having telescopes in space is keeping them at the correct and constant temperature. 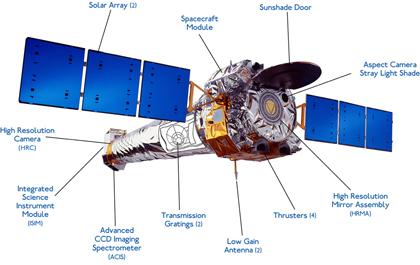 It's not just because telescopes like Chandra like to be comfortable â€“ it's crucial in making the instruments perform as they should and return accurate science.